Mystery surrounds the invention of the wheel. Was it created in Mesopotamia in 4000 BC to make pottery? Or did its inventor visualize rolling when he tired of dragging his cart through the dirt? Regardless of this historical uncertainty, the real question should be: Why did it take so long for the bike to follow? 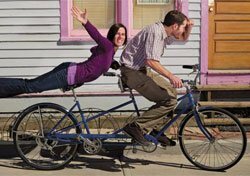 It wasn’t until the early 1800s that the first version of a bicycle—a two-wheeled device that was straddled and propelled by walking—surfaced in Germany. Pedals showed up roughly 50 years later, and these early velocipedes were often referred to as “boneshakers” because they were made entirely of wood— even the tires. Metal tires and frames soon ensued, and solid rubber tires graced the first true bicycle—the penny-farthing— which had an enormous front wheel. The first chain-driven bike followed, and by 1900, bikes were affordable, complete with gears, and enjoyed by both genders. The tinkering with and zeal over bicycling has never stopped. Schwinn introduced the balloon tire in 1933 and the kickstand in 1946. And in 1963, the company revolutionized many of our childhoods by introducing the Sting Ray and banana seat. The 10-speed bike also became commonplace in the 1960s, and in 1984, cogs were added to the rear gear cluster to increase the number of speeds to 24. Mountain bikes competed in the 1996 Olympics. Bicycling crosses generations and genders, delights both athletes and amateurs, and spans the globe from Algiers to Amsterdam. 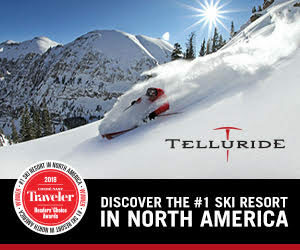 And the pedaling craze hasn’t missed Telluride. Most Telluriders own a bike. Many own more than one. We talked to a cross section of locals, all with bikes on their minds and smiles on their faces. How did you get into biking? My dad took my brother and me trail riding. I always loved it, and I liked taking bikes apart and putting them back together. What was your first bike? It was a Schwinn String Ray with a banana seat, a square tire on the back (for skidding) and a five-speed shift. My parents got it at a garage sale; all my friends had BMX bikes, so it wasn’t cool. What types of bikes are in your fleet? They have to be unique and have character. I have many weird bikes, a 20-inch road bike or a late 1950s road bike, for example. What’s your greatest biking tragedy? 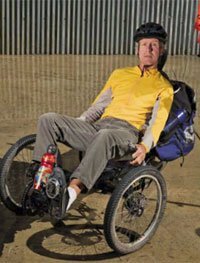 My Xtracycle was stolen. Approximately how many miles do you bike a week? Not enough. I bike because…It keeps me sane. This photo: 1959 Hercules folding bike. How did you get into biking? An old roommate in California rode mountain bikes, so I started riding with her. Then when I later worked at Paragon, where some of the mechanics got me into riding downhill. What kind of riding do you do? Trail and downhill. What types and makes of bikes are in your fleet? Specialized Big Hit and Specialized Women’s Expert FSR. What’s the shop value of your best bike? Approximately $5,000. What’s your greatest biking tragedy? Three stolen bikes. Who is your biking hero? Marla Streb, National Mountain Bike Champion. This photo: Specialized Big Hit. What kind of riding do you do? A lot of transporting: dog, groceries, kids, mail. How many bikes do you own? Six (as a family of four with one dog). Which bike is your favorite? Matheau says his bike is the favorite “’cause it’s full of speed.” Approximately how many miles do you bike in a week? 100 percent more than we drive. This photo: Elecktra. 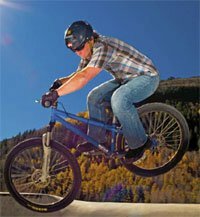 How did you get into biking? I love the low-carbon footprint. What types of bikes are in your fleet? 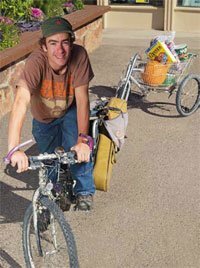 A BMX bike and a Trek with a Free Radical Xtracycle and shopping cart trailer. What’s your greatest biking tragedy? Someone vandalized my Xtracycle in San Francisco. They cut off the straps! This photo: Trek with Free Radical Xtracycle with shopping cart attachment. How many bikes do you own? Two: one is a Specialized Enduro Pro; the other is this GT stretch cruiser frame with custom components. What’s your greatest biking tragedy? I have crashed my cruiser several times because of the low pedals and a beer or three. I bike because… There’s no snow to play in. 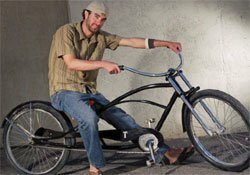 This photo: GT stretch cruiser frame with custom components. 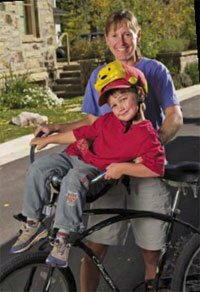 How did you get into biking? It was a childhood love that turned into knee rehab [physical therapy]. How many bikes do you own? Four. How much is your bike collection worth? Approximately $15,000. 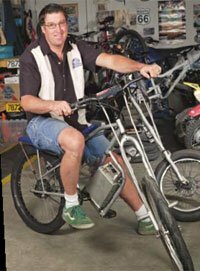 What type and make of bikes are in your fleet? Custom-made dirt-jumping bike, Devinci Ollie downhill bike, Specialized Epic cross-country racer, Trek Madone road bike. Which bike is your favorite? My Devinci Ollie downhill bike that is worth approximately $6,000. Who’s your biking hero? Shaun Palmer, professional mountain biker. How many miles do you bike a week? All of my miles. I don’t own a car. I bike because…I’d ride motorcycles, but they make people fat—and they’re bad for the environment. This photo: Custom-made dirt-jumping bike. How did you get into biking? All little boys need a bike. What do you like about your bike? Landon: It makes me go fast and look cool. Kai: It keeps me cool when I’m cruzin’. 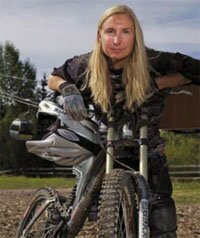 What are your greatest biking tragedies? Landon: Getting high centered with training wheels. Kai: Being too short to reach the pedals. Who’s your biking hero? Mom. Because she pulls us in the bike buggy. 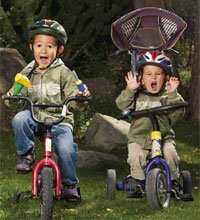 This photo: Specialized Hot Rock and Canopy Trike. What kind of biking do you do? We do it all. How many bikes do you own between the two of you? 11, a bike for every occasion. What’s the value of your combined collection? Approximately $3,000 (Diana’s) plus $9,000 (Daniel’s) = priceless. We bike because…It does a body good. This Photo: Schwinn Twin Delux. Who’s your biking hero? Lance Armstrong because he’s a cancer survivor. Approximately how many miles do you bike in a week? 80 to 160. 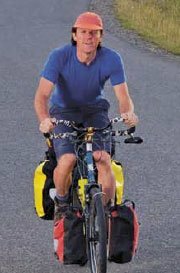 I bike because…It brings me joy and takes me out of my head to a zone where I don’t listen to the dialogue in the back of my mind and for the sheer joy of moving outdoors under my own power. This photo: Velotechnik custom-made recumbent. How many bikes do you own and what is their approximate retail value combined? I counted at least 15 pairs of handlebars, and my collection is worth approximately $40,000. What’s your favorite bike and why? 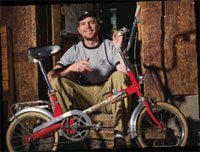 The Phat Daddy: It’s an electric chopper and snowbike. I’ve spent a lot of time on that bike. What is your greatest biking tragedy? I crashed a road bike into a VW bug. That was the end of road biking for me. I bike because…It’s possibly the greatest invention of all time. Only the great condor has a better glide ratio. This photo: Electric Phat Daddy.